Northern-Irish singer-songwriter Foy Vance couldn't visit Seattle, Washington, without seeing its “heart and soul” and top visitor attraction: Pike Place Market. Created in 1907, this public market is one of the oldest continuously operated public farmer's markets in the country. It receives more than ten million visitors each year, making it one of the world's most popular for travellers worldwide. “We think of it as the heart of the city. The community relies on this market”, explains John, guitarist and frontman of The Long Winters. 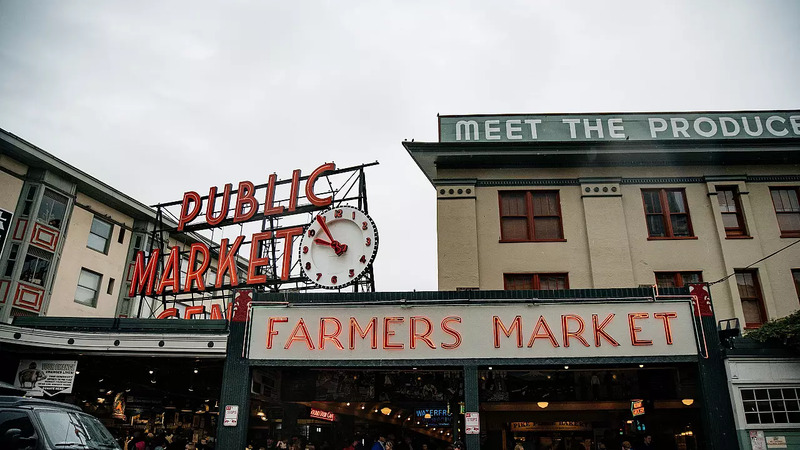 Seattle owes this initiative to city Councilman Thomas Revelle, who proposed the creation of a public market where farmers could sell directly to consumers, after the soaring price of onions in 1906 and 1907. Over time, the market has become the heart of the community, where small farmers and traders gather to sell their authentic products. “There was a period in the middle of the 20th century where developers wanted to tear it down”, explains John. But in the end, it was the local people that came to the market’s rescue. “That community engagement was one of the first beginnings of the historic preservation movement in America”. The market even boasts an oversized "piggy bank", where people can deposit money to help keep the market going. 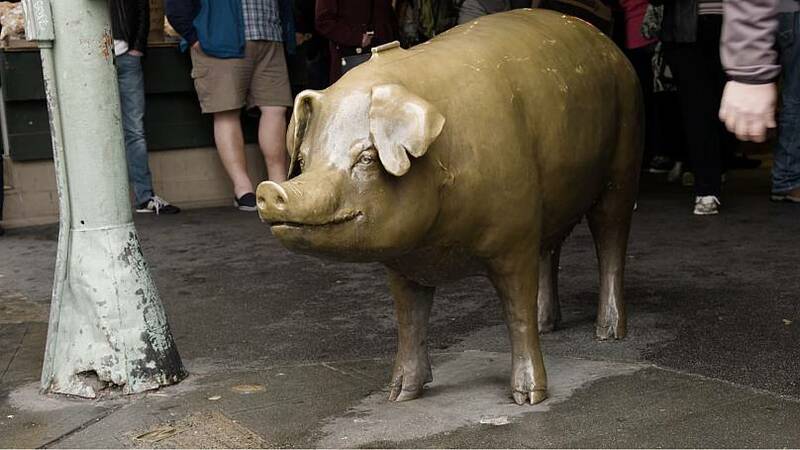 The large bronze pig weighs 250 kg and has been installed at the entrance since 1986. Working in the market is common among young local people. “It’s kind of a right of passage”, the musician explains to Foy. “You know everybody else in the market [...] Those are the people that you end up dating, and those are the restaurants you end up working for”. The market is famous for its fresh produce. Visitors can find almost everything: from giant fish to flowers and crafts of all colours. “Food has become so industrialised. Now we want organic food, now we want locally grown. It’s why the market it’s so popular, it’s why people come from all over the world to see it”. 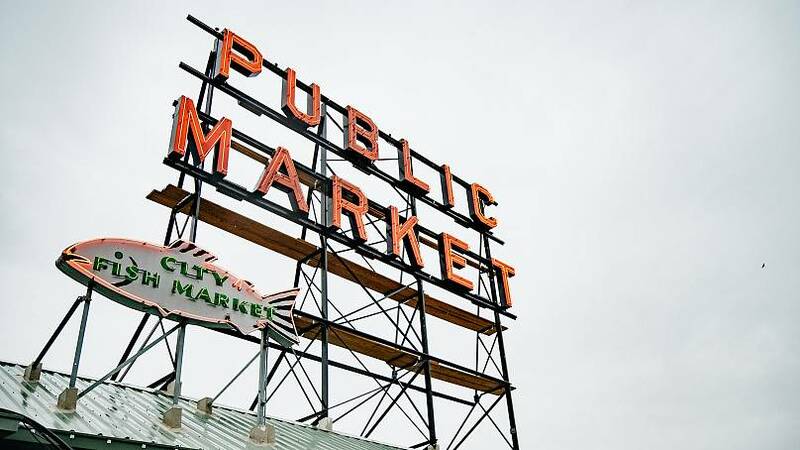 Pike Place Market is also acclaimed for its fish and seafood. “They have some of the best fish you’ll ever get [...] You can buy almost anything from the sea here, caught that day”. The fishmongers also have a novel tradition: fish throwing. The local fishmongers throw the ordered fish between them, shouting the orders in unison. It’s a decades-long tradition that attracts swathes of visitors every day. Watch the above video to discover the market for yourself.